If you think Monsanto is an evil corporation because of what that company has been doing to the world food supply, consider the secret operations of Halliburton & Co.
Halliburton has established a non-stoppable disaster that has been actively destroying our nation’s underground fresh water supply. You remember Halliburton. This was the company that botched up a cement seal on the British Petroleum Deepwater Horizon drilling rig which led to the explosion that killed 11 workers and caused the worst oil spill in world history. That disaster in 2010 has all but destroyed the water in the Gulf of Mexico and had a destructive impact on tourism, fishing and other industries operating from Texas east to Florida. Now it turns out that Halliburton has been busy since the early 1960’s utilizing a “secret” operation called fracking to force an estimated 30 trillion gallons of toxic nuclear, biological and chemical waste hundreds of thousands of feet into underground wells. The idea was this material, encased in Halliburton’s wonderful never-failing cement, would be safely stored away like Tupperware for millennia. “Out of sight, out of mind,” so they said. It was all done secretly in a cooperative agreement with the U. S. Government, Union Carbide Corp. which operated nuclear materials divisions at the Oak Ridge lab in Tennessee, big pharmaceutical companies and the Environmental Protection Agency. All of this is according to a report by TruthstreamMedia.com, which states that it has uncovered published newspaper accounts of the operation dated 1964. At the time Halliburton was credited with solving the problem of disposing radioactive nuclear waste when the operations at Oak Ridge were a deep military secret. The alternatives had been burying the waste in lead-lined containers or dumping concrete-encased barrels of waste in the ocean. Both of these alternatives were extremely costly and had serious implications. 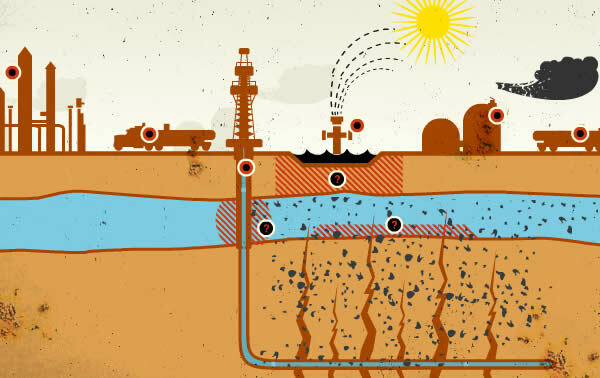 It seems that fracking is not a new method of drilling holes in the ground. According to the old news stories, both Halliburton and Dowell, a subsidiary of Dow Chemical Company, were the top fracking companies in the United States. So they weren’t just using chemicals and explosives to crack open rock formations to get access to oil and gas reserves in the 1960’s. They were also using the technique to open holes deep underground to hide materials so dangerously toxic they couldn’t find anywhere else to put it. Rocket technology in Hitler's Germany was still in its infant stage so sending the toxins to the Moon was not an option. The scientists involved in the fracking methods of hiding this crap were using computer modeling to assure the EPA and other high government officials that the waste they were shoving deep into the ground would pose no threat to aquifers and fresh water wells. Another news story published in 1973 revealed that disposal of nuclear waste through fracking was still going on. And the people involved in this still secret business were still promising that there was nothing to worry about. They apparently believed the stuff was going to remain locked in cement for the next million years or longer. An Associated Press investigation in 2011 revealed that 48 of 65 nuclear sites in the United States were leaking tritium, a radioactive substance, into groundwater. The leaks were traced to corroded pipes and tunnels. As drilling companies continue to employ fracking in a stepped-up quest to discover new sources of oil and gas there has been a literal shocking result in areas where this activity has been occurring. Earthquakes are shaking homes and businesses in states where earthquakes rarely happen. Earthquakes signal shifting plates of rock deep in the earth. And shifting rocks are bound to be doing something to all of those cement-bound blocks of toxic nuclear and chemical waste. Once free the poisons have a way of slowly seeping for miles until finding their way into aquifers and water wells. A good example of this occurred in 1984 when radioactive waste was detected in water monitoring near a deep injection well at a government nuclear plant at Oak Ridge, Tennessee. The investigative internet publication ProPublica reports an estimated 2 million abandoned and plugged oil and gas wells in the United States, with over 100,000 of them not appearing in public records. The report states that while all were supposed to be "permantly" sealed with cement, studies have shown that cement breaks down over time and these old wells are definitely starting to leak. This means those cement-sealed toxic Halliburton injection wells also are beginning to leak. Thus we have a massive unwanted toxic disaster lying deep under our feet that is, in effect, a ticking time bomb. It is only a matter of time before the nation's fresh water aquifers are going to be filled with deadly toxic sludge. A lot of people are going to get sick and die, and they may not understand why.